I have very recently been a bit obsessed with the Pantone Colour of 2012 - Tangerine Tango. So even though I had done an earlier shoot titled Tangerine Tango Calm, i still had a Part 2 of it. This time around I wanted to work on some of the challenges I experienced during the first shoot. Everyone learns everyday and i am not an exception to that rule. I will explain some of the challenges and also breakdown how I tackled them this time around. 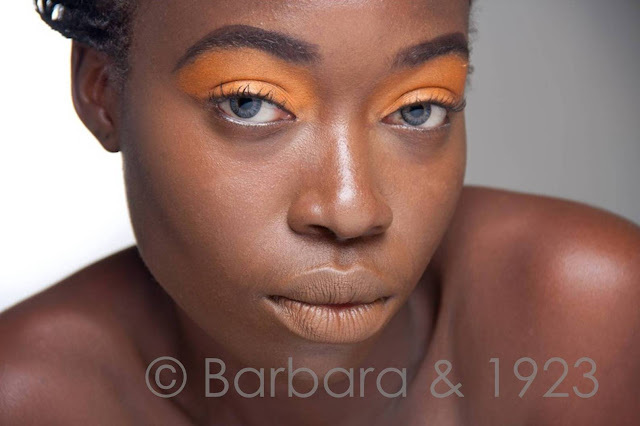 I had used concealer as the base for the e/s and applied the Tangerine colour with a brush. I did not take into consideration the complexion of the model against the colour of the e/s. When I noticed this, I proceeded to blend a bit of l/g with the e/s and apply with my finger onto the eye lid. I had gone shopping for a beautiful matte Tangerine blush earlier in the week but this was to no avail. I came back home and hugged my Blush Tropicana blush (lol) close to my heart. 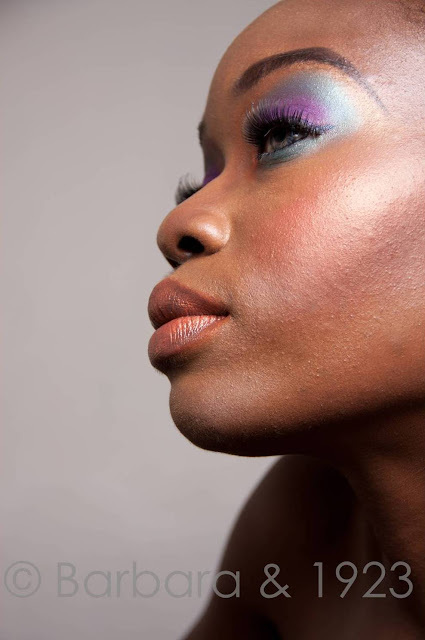 I created a canvas of beautiful skin and applied only the Tangerine blush to her face. I don't know how to describe it but her face was off. We tried different angles and more blush application but it was still off. By a stroke of fate and out of sheer frustration, I did a light application of the Zaron orange l/g sample I had in my kit and "Eureka", we found the missing piece. A hint of strong Tangerine colour on the lips. Just a hint, in order to balance the cheeks. Imagine my surprise when the very week after the first shoot, i read an article where it was mentioned that Tangerine blush alone is never a good idea. The lips were the most fun at both shoots. Both colours were custom mixed from all the orange lip colours in my lipstick pill box and they both came out beautifully. I know that some of the challenges I mentioned I have been already been discussed in some other beauty blogs. I am however of the opinion that nothing beats first-hand experience. So even though I had read and heard about some of them, experiencing them made me understand better and find my own ways of tackling them. We had 2 directions for the shoot and I must confess that the second direction was totally random and not planned at all. Once again, a custom mixed colour. I promise to take note of the l/s I mix next time. To see the finished pictures from both Tangerine Tango Calm and Just A Little Colour shoots, check out my FB page - Barbara & 1923.
very nice colour of lipstick. i really like it.